The Major League Baseball season started today, with former Rainiers pitcher Derek Lowe and the Atlanta Braves shutting down the Washington Nationals, 2-0. Ex-Rainiers Eric O’Flaherty (one scoreless inning for ATL) and Mike Morse (0-for-4 for Washington) also appeared in that game. The Mariners open Friday night at Oakland, with a 7:07 pm first pitch. You can watch it on Root Sports. As for the Rainiers, we don’t start until Thursday at Sacramento. We’ll have the broadcasts for you on 850 AM once again, and the broadcast should be streaming online – technology willing! It’s might be quiet here on the blog for a few days: the Rainiers Front Office is moving back into Cheney Stadium and Rainiers President Aaron Artman has declared “All Hands On Deck.” That includes your faithful RG. The ballpark opens to the public – for free – with our annual Pre-Season Party on Saturday. It lasts from 11 am to 2 pm, and there will be free hot dogs. Come see us and say hi – oh, and please don’t spill any mustard on the new stadium, thank you! I’ve been doing research to prepare for the start of the season. Every year I key in the list of former Tacoma players and coaches who are now coaching in the minor leagues. It’s really for my own reference, but I might as well post it here, so it’s after the jump if you are curious. The Mariners set their 25-man Opening Day roster yesterday – barring any late trades or waiver claims. As I type this, the Mariners official site has 26 players on the roster – but three of them are starting the season on the disabled list (David Aardsma, Matt Mangini, and Franklin Gutierrez). Two non-roster invitees are missing (Luis Rodriguez and Ryan Langerhans). The club will probably wait until the last minute before officially adding Rodriguez and Langerhans, just in case any late trades develop. This Larry LaRue blog post has an easier-to-look-at Mariners roster. The final move was waiting to see if lefty reliever Cesar Jimenez would clear waivers. He did, and has been assigned to Tacoma. Now we wait for the Tacoma roster. We should know it by Tuesday at the latest – but some years we get it on Mariners opening day, which is Friday. At any rate, I’ll post it here on the blog as soon as I am able. LaRue has a list of Mariners spring surprises and disappointments. The big surprise on the M’s opening roster is reliever Tom Wilhelmsen, who didn’t play for five years and now jumps from low-A to the majors. He’s one of the best stories in all of baseball this spring but I’m not sure the story has gained any traction outside of the Northwest. It will – it’s only a matter of time. Since nobody else is writing it, I will: congratulations to now former Rainiers reliever Josh Lueke, who has made the Mariners Opening Day roster. Here’s a good piece from Matthew Carruth to get you ready for Opening Day: Five Questions about the 2011 Seattle Mariners. Jim Caple of ESPN.com leads off his column with a story about Dave Niehaus and Rick Rizzs. Some PCL pre-season stories are starting to trickle in: here’s a preview of the Tucson Padres, and another of the Reno Aces. I like Tucson, I’m glad they’re back in the league, and I can’t wait to go down there, but I’m forced to give the Tucson Padres a big “F” for their new mascot – which is identical to the San Diego Padres mascot. Boooooooooo! They want fans to name the Friar. How about Fake Friar? Or Faux Friar? Maybe we should call him Plagiarize the Padre? I’ve got it: The Uncreative Abbot! The Oklahoma City RedHawks have a new affiliate in the Houston Astros, who showed up for an exhibition game last night. In this notebook, we learn that the crowd was small, and that RedHawks skipper Tony DeFrancesco has named Jordan Lyles his opening day starter. Speaking of opening day starters, when I was in Arizona over the weekend I counted the days and it appeared that both Blake Beavan and Luke French were in line to start the Rainiers season opener. Daren Brown was tight-lipped when I asked him. Former Mariners pitcher Jamie Moyer will be an analyst for Baseball Tonight this season. Several of my Rainiers co-workers were not alive when Moyer made his major league debut. Everyone is posting their pre-season predictions this week. Here’s the one you should read: Larry Stone, who is kinda hot with the predictions right now. What do you see in my future, Soothsayer Stone? The Mariners released some lower-level minor leaguers, including players I wanted to see just because of their names, like Hawkins Gebbers and pitcher Jake Wild, as well as ex-Rainiers pitcher Paul Abbott’s son Lance Abbott. Also released was Derek Saito – the pitcher the M’s received with Dan Cortes in the Yuniesky Betancourt trade. Friend of the blog Rob Neyer wrote something short and funny about former Tacoma Twins player-manager Tom Kelly. If your interested in the FSN-to-Root Sports transition, here’s some info about that from Forbes. Perhaps you heard that Major League Baseball has opened a new seven-day disabled list for players with concussions or concussion-like symptoms only. I think this is a really good idea. In the minor leagues the DL is seven days, period. In the majors its 15 days, which makes it a challenge to DL a player with a minor injury that might cost him 4-5 days, and thus requires a team to carry capable reserve players. But with concussions doctors can’t immediately tell if recovery time is three days or possibly months or even years. I think a 7-day disabled list for concussions is a good call. At the end of yesterday’s post I guessed the Rainiers starting rotation. Just a couple hours later I learned how wrong I was. Knuckleballer Charlie Haeger had back surgery and is out for at least two months. And I forgot about Chaz Roe, who remains on the 40-man roster. So, we’re looking at – again, this is a guess, but a more educated guess than yesterday – French, Beavan, Seddon, Roe, and Petit or Grube. And out for about two months but coming later in the season are Haeger, Nate Robertson, and Mauricio Robles. Today Felix Hernandez had his final pre-season start. Instead of facing the division rival Texas Rangers in the regularly scheduled Cactus League game, the Mariners decided to “hide” their ace and have him pitch in a minor league intrasquad game. 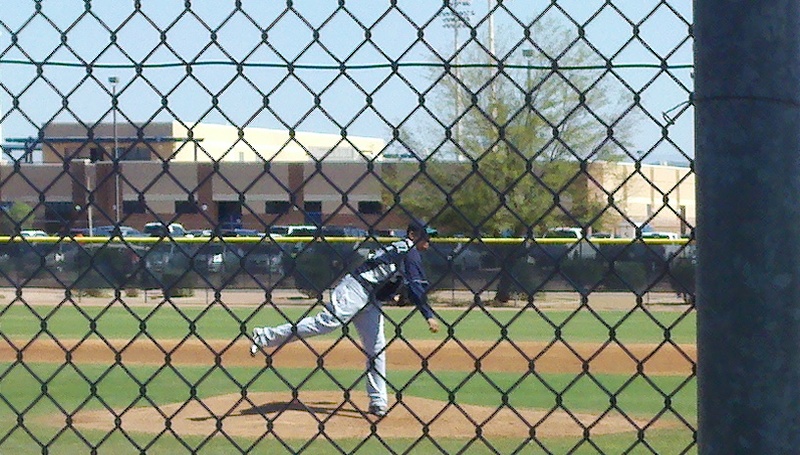 So at 10:00 AM on a Sunday morning, Felix was pitching for the Tacoma Rainiers out on Field 3 in the Mariners minor league complex. And the reigning American League Cy Young Award winner was facing a group of Class-A and AA hitters. It wasn’t exactly a fair fight. However, it was fun to watch. Here’s a look at the scene. A crowd of less than 100 gathered. It's basically like a baseball game played on a very well-groomed high school field. 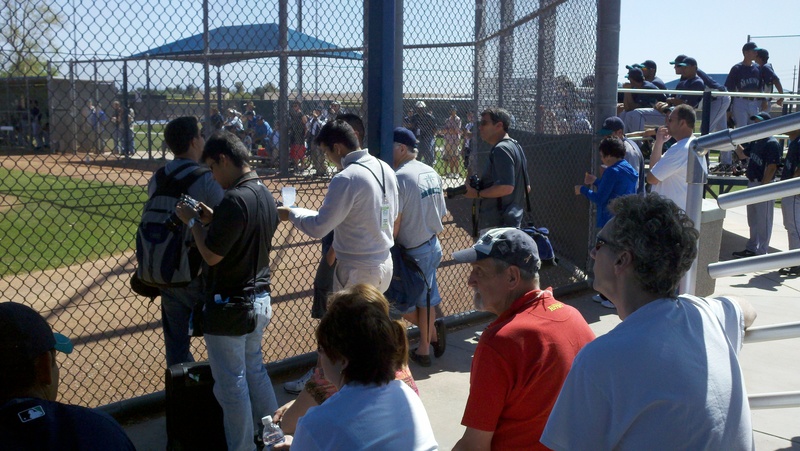 Media, scouts, and non-participating minor league players gathered behind the plate. Felix absolutely dominated. He didn’t allow a hit until the fifth inning, when 17-year-old Dominican bonus baby Phillips Castillo grounded a single through the left side. It was a big moment for Castillo. Felix faced a few Double-A players – Nate Tenbrink, Joe Dunigan, and Johermyn Chavez were among his opponents – but he also faced a number of Class-A and short-season prospects. They didn’t score off Felix – in fact, he gave up just two hits (Chavez had a broken-bat single). In the third inning, Felix needed about 11 pitches to strike out the side. Pitching coach Carl Willis had him stay out and face another hitter. I was hoping for the rare four-strikeout inning, but the hitter put the ball in play. In the sixth, Felix struck out Castillo but wanted to work on pitching with runners on base – so he told Castillo to take first. Castillo was then thrown out by Miguel Olivo trying to steal – and Felix told him to stay at second. Olivo nearly picked him off afterwards – we were hoping Castillo would be put out three times in one “inning,” but no such luck. Blake Beavan opposed Felix and did not have a good game. He allowed three runs in the first, and three more in the second before settling down and delivering three straight scoreless frames. In the first inning Sean Kazmar doubled off Beavan and scored on Miguel Olivo’s base hit to center. Mike Carp also singled off Beavan. In the second inning, intriguing 2010 draft pick Jabari Blash hit an opposite-field homer off Beavan. After Felix left the game, Josh Fields tossed a scoreless inning. Fields has been working out with the Double-A group. Tacoma had a designated fielder: Jack Wilson played second base, but he did not bat. He was looking to get some ground balls, but Felix kept striking out Class-A hitters. I’ve been trying to get a handle on the Rainiers roster, but there is still a group of about 35 Triple-A players that needs to be cut down to 24. Early in the day the Mariners optioned Matt Tuiasosopo to Tacoma, while sending Triple-A players Mike Wilson, Royce Ring, Denny Bautista and Justin Miller to minor league camp. If I had to guess, I would suggest a Tacoma starting rotation of Luke French, Blake Beavan, Chris Seddon, Charlie Haeger, and either Yusmeiro Petit or Jarret Grube. But I am purely speculating right now. At The News Tribune, Ryan Divish wrote a column about picking the World Series participants. At The Times, Larry Stone has a story on the two players the Mariners are focusing on for the #2 pick in the June draft. Michael Pineda made a statement on Saturday: he’s ready for the big leagues. Tacoma Rainiers 3rd string Official Scorer Mike Jessee is here and he wanted to say hello to all Mike… Off-Mic readers. I had dinner with Rainiers manager Daren Brown and pitching coach Dwight Bernard last night. They weren’t able to shed any light on the Rainiers opening day roster – they’re waiting for the Mariners front office to make their final decisions, just like everyone else. On Monday I’ll be able to watch about half of the Triple-A game before heading off to the airport. If I can sneak in a blog update, I will. I drove out to Surprise! for the Tacoma-Omaha spring training game today. I thought about turning this whole blog post into Surprise! jokes but the only one I could come up with was: Guess which city is entirely made up of traffic lights that are bunched too close together? Surprise! See, it’s not even that funny. Tacoma started left-hander Anthony Vasquez, who appears to be ticketed for Class-AA. Omaha countered with lefty Edgar Osuna. Defensively, Tacoma had an infield of Johan Limonta (1B), Dustin Ackley (2B), Sean Kazmar (SS), and Alex Liddi (3B). The outfield was Mike Carp in left, Greg Halman in center, and Carlos Peguero in right. Jose Yepez was the catcher. This could very easily be a regular season Tacoma starting lineup. Yepez is apparently the #5 catcher in the organization, behind Olivo, Moore, Bard, and Gimenez. Don’t ask me what the batting order was, because there wasn’t one. Mariners Adam Kennedy and Jack Cust were there to get extra at-bats, and Kennedy led off every inning while Cust batted third or fourth in each inning. Neither played defense. Even with their major league ringers getting seven at-bats each, Tacoma trailed 8-3 when I left in the bottom of the eighth inning. They were going to play ten innings regardless of the score, because they had ten innings of pitching to get in. Tacoma was down because Omaha has two of the best hitting prospects in baseball, and they each went deep. Mike Moustakas hit a long home run (which I missed) in the first inning, and I saw Eric Hosmer crush a line-drive three-run shot in the third. Both are left-handed hitters, and both hit their homers off the lefty Vasquez. Tacoma had a few offensive highlights: Johan Limonta hit a hard liner to right in a left-vs.-left situation against Osuna, and Greg Halman hit a rocket to the opposite field corner for a double. Manny Delcarmen relieved Vasquez in the sixth inning and went two frames. I watched one of his innings from behind the plate and he topped out at 93 mph on the Rainiers gun. Edward Paredes came on to pitch the bottom of the eighth. At that point many of the Rainiers players were out of the game and Class-A minor leaguers were playing instead, plus I had received an ominous message from Kirby Arnold about traffic in Sun City when the senior buffets open at 4:00, so I took my privilege and headed out. Blake Beavan was jokingly talking smack about his intersquad game tomorrow morning: he matches up against Felix Hernandez. We decided that the only way Felix wins is if Beavan doesn’t get to bat. Coaching can be dangerous: Rainiers hitting coach Alonzo Powell was sitting on a folding chair next to the first base dugout, filling out his hitting chart when Adam Kennedy somehow hit a sharp foul ball backwards through his own body. It took two wicked hops and smoked ‘Zo right in the elbow. He didn’t rub it. Meanwhile, Daren Brown was doing a poor job of hiding his laughter in the third base coach’s box. We received news today that outfielder Gabe Gross elected to become a free agent rather than join Tacoma. Gross would be a good player for the Rainiers, but that helps clear out an over-crowded roster. Tacoma Assistant To The Head Trainer Jeremy Clipperton wanted to send a friendly “hello” out to all of the Mike… Off-Mic readers. Tomorrow morning the intersquad game should be fun, with Felix facing a bunch of Rainiers hitters. I’ll post my impressions in the afternoon. Well, my first day of spring training, anyway. I flew into Arizona today. My flight was slightly delayed and then there were epic lines at both the Rental Car Shuttle and the Rental Car Counter. I was running late for the Triple-A game and I had to eat quickly, and I knew just the place. Of course, I was planning on In ‘N’ Out ever since my last trip to an In ‘N’ Out State back when I was on vacation in October, so I wasn’t going to miss it. I scarfed my Double-Double and headed to the office at the Mariners complex. I picked up my pass, media guide & minor league roster, and said hello to the members of the Mariners PR Staff who were preparing for tonight’s Dodgers-Mariners exhibition. Then I walked through the media room and was briefly entertained by the comedy team of Arnold, Johns & LaRue before heading out to the minor league fields to watch the Triple-A game against Tucson/San Diego. Let’s just do it in bullet points, because I don’t have much time to type before heading back out for tonight’s major league game. Before I left the media room, Kirby Arnold told me that the Mariners had returned Rule 5 pick Jose Flores to the Cleveland Indians, which opens up a spot on the 40-man roster. I was 50 feet out of the office when I bumped into Michael Pineda. He said he’s feeling great, and we came to a friendly agreement that we do not want to see one another again this season. Rainiers batting coach Alonzo Powell was hanging out in the batting cage, waiting for hitters to stop by. He told me he bought a house and moved the family to Peoria, which is making spring training much more comfortable for all of them. Like everyone I spoke with, he’s really looking forward to seeing the remodelled Cheney Stadium. Blake Beavan said hello and told me he’s pitching the intersquad game on Sunday, which I plan to attend. I finally made it out to the quadrant of minor league fields. The M’s were playing the Padres in a Triple-A game on one field, and in a Double-A game on another. The other fields were used for individual workouts. It felt like it was about the 4th inning when I arrived – although it’s hard to tell, since there is no scoreboard. The first thing I noticed was the Padres major league lefty Wade LeBlanc was pitching against the Rainiers. Brown, Bernard, and Powell are coaching the Mariners tonight against the Dodgers. It was a split squad today – much of the major league staff was in Mesa for an M’s-Cubs day game. In the game, Greg Halman had a nice line drive single to center off LeBlanc, and he later scored on a base-hit by Class-A catcher Carlton Tanabe. Carlos Triunfel was playing for Tacoma and he ripped an RBI triple to left-center off LeBlanc. Triunfel is visibly in far better physical shape than when I saw him last spring. If Triunfel doesn’t break camp with Tacoma it will only be because there are so many experienced infielders. Speaking of experienced infielders, Sean Kazmar played shortstop late in the game and made a terrific diving stop on a hard grounder up the middle. He was able to scamper to his feet and throw out the speedster Luis Durango at first base. I was standing with a group of Mariners minor league coaches when this happened and you could tell Kazmar is the type of player that coaches love. Third baseman Alex Liddi has a less-than-stellar reputation on defense, but he made a nice charging scoop-and-throw of a weak grounder, drawing hoots and cheers from his teammates. Injuries: Matt Mangini has a strained quad and is out until at least mid-April. Luis Jimenez – the left-handed slugger the M’s signed as a free agent – hasn’t played much due to a groin problem. I didn’t see him, but apparently Jimenez is huge. I don’t know who the starting pitcher was for Tacoma – I missed him – but relievers Fabio Castro and Mumba Rivera pitched, and an A-ball lefty named Jose Jimenez also worked an inning. Dustin Ackley played the first half of the game at second base before giving way to Leury Bonilla. I saw Ackley coax a walk from LeBlanc. Chris Seddon was sitting on the riser behind the plate, charting pitchers. He was working so we didn’t chat – although we exchanged waves, which was nice. There was an amusing moment when a man with an Australian accent asked me if I knew the score. “No” I replied. He asked if it mattered and I said “nope!” The three or four of us watching all laughed. That pretty much summarizes minor league spring training games. That’s a bit of a stretch, though. 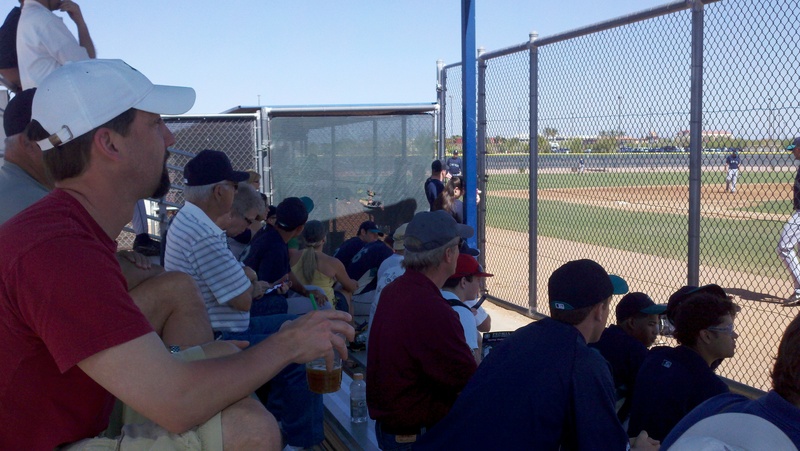 The final score doesn’t matter, but the player’s individual performances are crucial in determining which – if any – minor league team a player gets assigned to for opening day. Guys are fighting for their jobs and in some cases their career out there on the back fields. Here’s an update from Larry Stone on former Mariners in spring training with other clubs. Special thanks to the people at Baseball America for posting the active career minor league statistical leaders. Who would’ve guessed that former Rainiers outfielder Jeremy Reed is the active career leader in minor league batting average? Ever wonder why they started playing the National Anthem before baseball games? Me, too – particularly when some 6-year-old is warbling his or her way through it on a Tuesday night in Colorado Springs. This story sheds some light on it – the pre-game Anthem has been a baseball staple since World War Two. I am already dangerously addicted to Tim’s Sea Salt & Vinegar potato chips, so it is with some trepidation that I tell you Tim’s is now the Official Chip of the new Cheney Stadium. This is disappointing: the M’s Class-A High Desert affiliate stopped broadcasting games this year. They are the only California League team with no radio or internet broadcasts. I’m off to tonight’s major league game. If anything interesting happens I’ll post about it Saturday morning – otherwise, look for a blog on Saturday evening after I get back from the Tacoma vs. Omaha game in Surprise! Just a quickie this morning to update two things. First, in case you missed it, Dustin Ackley was optioned to Tacoma yesterday. Look for Ackley to play daily in Tacoma for about two months as he continues to refine his defensive skills at second base while deftly avoiding MLB service time. Friday afternoon: In N Out (#1 priority) then Triple-A game, Tacoma vs. Tucson (SD) in Peoria. Friday evening: Meet with Tacoma coaching staff, or Mariners/Dodgers MLB night game in Peoria if Tacoma coaches are working it. Saturday afternoon: Triple-A game, Tacoma at Omaha (KC) in Surprise! Saturday evening: Meet with Tacoma coaches if it didn’t happen on Friday. Sunday evening: Open. Check out Talking Stick? CAZ? NCAA Hoops? Salty’s? Monday daytime: Triple-A game, Tacoma vs. Omaha (KC) in Peoria. I hope to have details of what I see in the Triple-A games, updates on Tacoma roster possibilities, and amateur photography. Check back over the weekend. You are currently browsing the Booth, Justice and the American Pastime blog archives for March, 2011.